On the recommendation of John Woods I set off for the Czech Republic in June 2010 for a week of Czech nymphing and instruction. Accompanied by my fishing accomplice from Denmark, Lars Hanson, we arrived in Rozmberk after a three hour taxi ride in pouring rain. Glimpses en-route of the Vltava river were not encouraging. It was running bank high and brown. The accommodation at the hotel on the riverside was completely taken up by us and twenty two other anglers. A briefing and talk in the tackle shop/fly tying room set us up for the next day when, sorted by nationality/language we were taken in groups of three or four to the river for an impressive Czech nymph demo by Jiri, one of the instructors and organisers of the event. 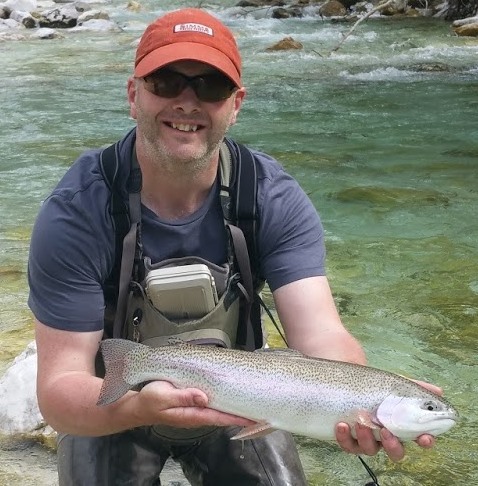 The rain had stopped but the main river was still unfishable so we were taken in cars to various small forest streams and headwaters for our first session. Armed with newly purchased nymphs Lars and I managed to fool enough small brook and browns to feel that we could be in for an interesting week. One of the boulder strewn streams we nick-named =Death Valley‘ and, although very agile, I wished that I was ten years younger than my 70. Drowning in the shallow pools was unlikely but broken limbs a distinct possibility. 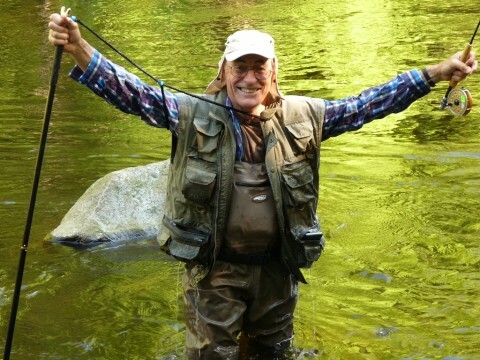 We rescued a large German angler who had fallen between two boulders. Luckily, the only breakage was his rod but he nursed some serious bruises to his nether regions. 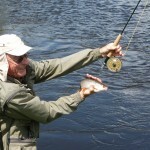 The main river quickly settled down and was now fishable so several sessions were held at various sites within a few miles of the hotel. I was rather hoping to catch some of the large grayling in the main river but only managed each day to catch one very large dace (No, not small chub). These dace are much larger than any that I have caught in UK in recent years and were the subject of some teasing as nobody else caught any. Evening after dinner was spent at the large weir adjacent to the hotel trying for some very lively rainbows. The highlight of the week for all of us was one day in the tightly controlled reserve towards the Austrian border, quite a long drive from base. Lars and I were dropped off twenty minutes walk from the upper Vltava which narrows here to about seven to ten yards and looks for all the world like an English lowland chalk stream. We spent several minutes just looking then Lars announced that he thought that he had died and woken in heaven. Heaven it was. Apart from two canoes passing through we seemed to have the whole of southern Bohemia to ourselves for the day. After a couple of small grayling I was into a much larger fish which, much to our surprise, turned out to be a very large roach. It was a magnificent fish around 2lbs+. 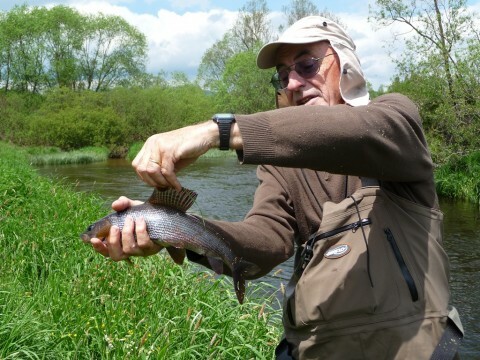 What I now so dearly wanted was a large grayling and this came after a fishless hour when I returned to our start point and was immediately into a good fish. It was just what I wanted, a grayling measuring 17 ˝ inches from fork to nose. 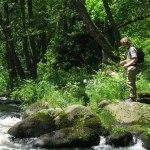 Not having a set of scales and being unfamiliar with the weight of large grayling, we quickly returned it to the water. The end of a beautiful day on a river bounded by natural wildflower meadows and the sky full of larks in full song. Only a very small number of day permits are issued for this water and the organisers of the event ensured that all the participants had a day there. 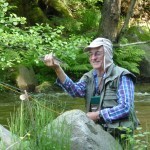 In conclusion, there is much more to tell but much has already been told in John‘s 2009 article – if you intend to follow our footsteps, take note of the need for a strong wading staff. Not being as young as I would like, my faithful rucksack/chair was a boon and also came in handy whilst waiting in the Ryanair scrum at Stanstead (our Bristol Easyjet flight had been cancelled at short notice). To circumvent the high luggage charges and sporting equipment‘ charges, we took only cabin bags (my chair/rucksack fits even Ryanair‘s cabin baggage measuring frame). Neither of us could afford multi-section travel rods so we put all rods, waders, boots, staffs etc. into one large borrowed snowboard bag. That cost Ł80 each way but our flight tickets were only Ł7.49 one way and Ł9.49 for the return. The return taxi from Prague was a luxury as the journey could be made by train or coach. A closer airport is Linz, Austria, but there could be problems in taking an Austrian hire car into the Czech Republic. There were no cheap flights to Lintz at the time. Summary: Good grub; poor range of beers; Don‘t even try the wine; good friendly accommodation; great atmosphere; brilliant instruction; we are never too old to learn.